Madeira Island is located in the Atlantic Ocean off the coast of Portugal and Africa, an island of mountains surrounded by deep blue sea. For many years it has been a favourite destination with tourists and is now very popular with Golfers. Madeira is a golfer’s paradise because its subtropical climate guarantees all year round blue skies and stunning views over the ocean, steep cliffs and most of all, great golf courses. Madeira has it all. Influenced by the Gulf Stream, sea water temperature varies between 26 °C during the summer and 17 °C in the winter. 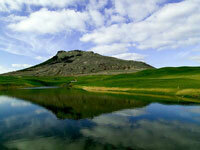 The exceptionally beautiful sceneries influenced the decision to built the Golf Courses in Madeira and in Porto Santo. However, in the north, the valleys contain native trees of fine growth. These laurisilva forests, notably the forests on the northern slopes of Madeira Island, are designated a World Heritage Site by UNESCO. The Madeira Islands with their eternal spring are the perfect golf destination all year round. Two different islands, three magnificent golf courses and a wide range of accommodation, leisure and wellness for all golfers. Surrounded by serene countryside and enveloped in a sea breeze, the Porto Santo Golf Course has everything you need to play golf the whole year round. It was designed by the Spanish golfing champion Severiano Ballesteros, and has been in operation for several years. There is an 18-hole par-72 course plus a 9-hole par-3 course Pitch and Putt. It lies in an area that extends from the vicinity of the Chapel of São Pedro to the north coastal zone, giving golfers spectacular views over both the south coast of the island, where there is a magnificent beach with golden sands, and the north coast, with its beautiful cliffs and islets. The Madeira Island Golf Open is a European calendar event, which every year attracts the best golfers to fight for victory hole by hole. According to the rules, the last two days of each tournament are played only by the 70 best contestants from the first two days. If you are a golfer, don’t miss the chance of visiting the Madeira Islands that week and seeing for yourself the three excellent golf courses that Madeira and Porto Santo islands have to offer. Here you can find the lowest green fees rates and the easiest and safest way to make your golf booking for your Madeira golf break.